Today's post is the second in my "Transitioning to the Workplace" series (the third if you count my post on business formal interview clothes on a student budget) discussing how to build a business casual work wardrobe on a fairly tight budget. Although I am almost a year into my career now, most of my work wardrobe was purchased at this general price point when I was a summer associate two years ago, and most of my items are still going strong. Shopping-wise, I'm finding that we're in a bit of a strange in-between season: Fall/winter items are not yet available, but summer items are also starting to sell out at many of my go-to retailers. As a result, I'm not able to offer many specific item suggestions, though I link to a few examples. I might also write a supplemental post with more cold weather-friendly choices in these categories later this year. Note: My approach here is not minimalist and is rather inconsistent with helping someone build a pared down (and high-quality) personal wardrobe that they love. The primary goal here (1) is to accumulate an adequate work wardrobe quickly on a tight budget, that of a graduate student summer intern or recently graduated entry-level professional. Also, (2) my item suggestions lean towards the formal side of business casual, which for many white collar NYC workplaces means no jeans, but slim pants and somewhat causal skirts and dresses are okay. Both goals mean that the resulting work wardrobe may exist quite separately from what one enjoys wearing outside the office. The goal is to blend in and pick things that will not raise eyebrows while one is still getting used to the applicable wardrobe rules. Workplace norms in different industries and different regions of the US can differ dramatically. It's somewhat unlikely for many of these items to see much use outside of the work week. 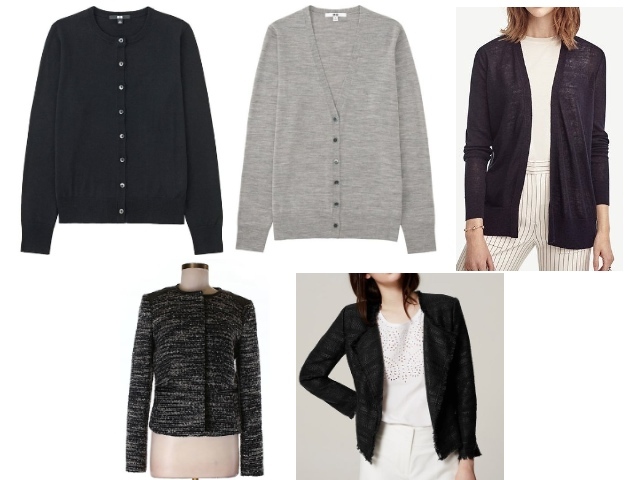 For today, I'm focusing on dresses and cardigans, and I include a very brief discussion of jackets. The right dress is almost a one-piece outfit, and it takes little work to look relatively polished and put together when wearing one. My women colleagues and I commonly joke amongst ourselves about how deceptive dresses are in that way: they look relatively formal, but they're sometimes we reach for when we're exhausted and don't want to put mental energy into what we're wearing. 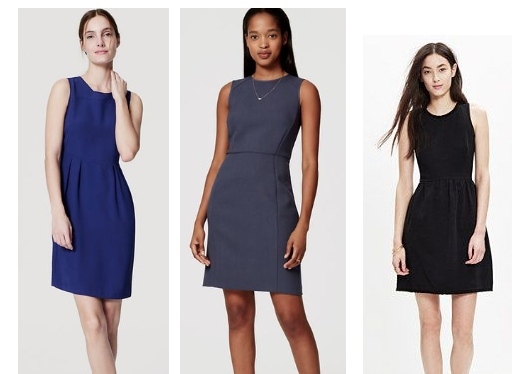 Plenty of retailers regularly offer suitable dresses at new graduate-friendly price points: Loft is where I got most of mine, and a good sale at Ann Taylor works too. Many of my colleagues also like Madewell and J. Crew Factory. With a "~30%-40% off everything" or one of the fairly constant "additional ~40% off all sale items" promotions, both of which are frequently available, it's fairly easy to quickly accumulate several suitable dresses somewhere in the ~$35-$65/piece price point at Loft and J. Crew Factory or closer to ~$65-$80/piece at Ann Taylor or Madewell. (The type of sweeping discount I recommend looking for is less frequent at Madewell though.) If you have the time to hunt and are fairly confident of what you're looking for in terms of sizing and brands, I might also recommend regularly checking TheRealReal, Ebay, and even Thredup for suitable choices, as new options appears frequently and often at a good price point, though shipping costs may be high and returns difficult or nonexistent. For maximum versatility and utility, i.e. the ability to rotate the same dresses week after week with only minor changes in shoes or accessories, I like sticking with solid colors. One can't go wrong with neutrals such as black, navy, or gray, but brighter colors can also see regular wear. Although I love prints and own several printed dresses, I get significantly better cost per wear from the solid colors. A dress being machine-washable is a massive plus. Loft is particularly great with offering machine-washable dresses. I find that there's considerable flexibility when it comes to which classic dress shapes or silhouettes are most suitable for work: fitted sheaths and sheaths with a fuller skirt all work well, as do fit and flare dresses, shifts, and others. It really depends on what fits best or what one likes wearing. The general hope is to find something that fits fairly well off the rack, which could take some trial and error before one figures out which brands work best. Many casual dresses from one's weekend wardrobe can be suitable for the workplace too, sometimes alone or dressed up with a cardigan or jacket, though the items I suggest below are on the more formal side, as far as designs go. Loft Pleated Flare Dress - ~$25 sale (limited size and color combinations, final sale) - When I was a summer associate, I picked up three similar fuller-skirted sheath dresses from Loft, two black and one navy, on deep additional percent off sale discount (~$25-$35 each), and they're still in heavy rotation in my work wardrobe today. Those dresses are all of decent quality when it comes to construction and materials, and all are in fairly good shape now, after being in heavy rotation for about three months that summer and almost a year after graduation. Loft Paneled Sheath Dress - no current sale, $89.50 - Loft also offers a few fitted sheath dresses from time to time, though I haven't tried these. My fitted dresses tend to come from Ann Taylor because their stuff fits me well off the rack, but I suspect Loft would be similar. Madewell Afternoon Dress - no current sale, $98.00 - Now is not the best time to buy a work dress from Madewell as their summer dress materials and designs skew casual, but I wanted to illustrate that they often have a few work appropriate dresses in stock. They also currently offer this design with a fringed hem. I think that trendy details, like a peplum, don't necessarily make work dresses less versatile if the item fits well, but the fringed hem is maybe a bit too casual-trendy for work for my personal taste. J.Crew Factory Tailored Shift Dress in Lightweight Wool - ~$35 with code (limited size and color combinations, final sale) - I reviewed this and found that while it didn't fit me, it could be a good choice for someone else. J.Crew Factory currently has a few colorful work dresses in stock, including this fuller-skirted daybreak dress and ladder stitch fitted sheath dress. Tahari Seamed A-Line Dress - $85.67 sale in select colors - Nordstrom's sale section might also be a good place to check out. For instance, they also have this Adrianna Papell pleated sheath dress ($65.66). It's no secret that office air-conditioning often runs a bit cold to be comfortable from the perspective of many women employees. Almost all of my work outfits include some kind of cardigan or sweater. (I don't like jackets as much because they rarely fit me well.) In summer, I mainly wear linen or linen-cotton blend cardigans, though various combinations of cotton, silk, and rayon or viscose would probably be fine if the fabric was light and thin. In fall or winter, when my firm's building gets quite cold, I don't have particularly specific material preferences for my cardigans: merino wool is nice, but I often find that it shrinks easily, sometimes even when hand-washed; cashmere is good for the coldest days and holds up to machine washing, though it's not easy to find at this price point without a super sale; I've ultimately found that I actually have the best luck with wool and synthetic (often nylon or polyester) blend sweaters, especially if they're machine-washable (Loft is a good source for machine-washable sweaters at the new graduate price point). Those synthetic blend sweaters hold their shape better. I end up needing to wash my cardigans somewhat frequently, so machine-washability is a major plus. As with dresses, I find that a wide variety of colors and general styles or shapes are all potentially useful in one's work wardrobe. For my cold-weather work wardrobe, I have a mix of neutral and bright cardigans, but I've ended up with only navy and black ones for summer. I tend to favor fairly loose-fitting cardigans, often open cardigans rather than ones with buttons, but this is another one of those things that's entirely down to personal preference. Because the main purpose of my cardigans is more practicality and keeping warm than formality, I'd even say that the fleece Bobeau wrap is suitable for days at the office where I don't have meetings. Uniqlo Extra Fine Merino Crewneck Cardigan - $39.90 - Also available in v-neck. Being wool, these are definitely for cooler seasons. I'd expect Uniqlo to have more color and style options and frequent sales throughout fall and winter. I have some qualms about recommending these: Uniqlo is fast fashion and while many other items have held up well for me, my last two Uniqlo merino wool cardigans developed small holes after about two years of only moderately frequent wear for each. That being said, their cardigans hold up so much better to washing and wear than, say, J. Crew's merino wool cardigans (which shrank heinously upon a first wash, even done by hand). I would at least recommend these over 100% merino wool sweaters from J. Crew and other mall brands that could drop to a similar price point during sales. Ann Taylor Linen Blend Open Cardigan - $41.70 sale - Most of my favorite machine-washable cardigans for both winter and summer come from Loft, but their stock is a bitlimited right now. This linen and rayon blend cardigan from Ann Taylor is fairly similar to summer cardigans I own from Loft. Loft Pointelle Stripe Open Cardigan - no current sale, $49.50 - I tried this on, but found that I didn't like the design on me as I prefer my cardigans a bit longer. The fabric (50% cotton, 40% viscose, 10% silk) is suitable for a summer cardigan. Read on for my brief thoughts about finding jackets! I actually strongly dislike wearing blazers. What few ones I own are mostly from my interview suits, including this one from the Limited, and only ever worn when business formal is required. Still, any discussion of women's work clothing, even in the business casual context, would feel a bit incomplete without some discussion of jackets. For the most part, most of my jacket selections are items that aren't as formal, but that I find easier to wear. Most of these jackets are a little less structured in design or made in softer materials than your average more formal blazer. If I felt like I wanted to wear blazers more often, I would likely stick to Ann Taylor or Loft as I find their jackets to fit me better than those from, say, Banana Republic or J. Crew. Loft Fringe Tweed Jacket - ~$40 sale - The fringe detail is not my favorite, but this is generally representative of the types of jackets I might like from Loft or Ann Taylor. Both retailers are likely to offer more options of this type of style in the coming months. Something more like this one on Thredup is perhaps a bit more representative of what I like. Zara blazers - I almost never shop at Zara because their sizing and quality can be a bit all over the place for me, but my only blazer that isn't from one of my suits is from the "Zara Basics" product line. The material, mostly rayon, is quite a bit softer than most other blazers, almost more like one of those blazers made out of casual clothing materials, and it even fit perfectly right off the rack.